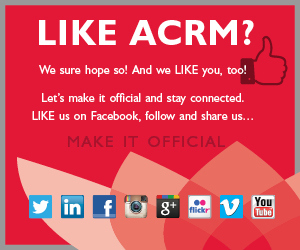 Located in the Fantasia Ballroom JH, the ACRM Expo is an extension of your learning experience. Take a break, enjoy some refreshments and learn about the latest rehabilitation technologies, products and services available. The scientifc posters will also be conveniently displayed within the expo. Look Who’s Coming to Orlando! 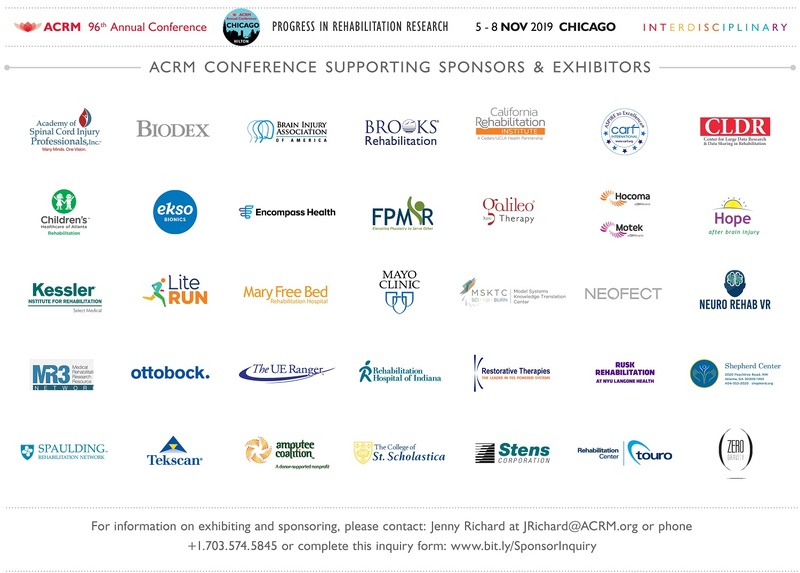 ACRM | American Congress of Rehabilitation Medicine is the preeminent association for evidence-based interdisciplinary rehabilitation, translating research into practice and practice into research to improve the lives of individuals with disabilities. 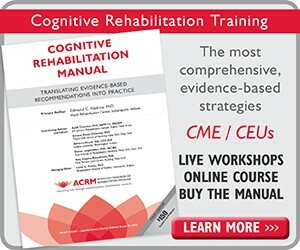 The ACRM scientific journal, Archives of Physical Medicine and Rehabilitation, is ranked ninth out of 63 rehabilitation journals and is the most highly-cited in the category. Enemeez® non-irritating formula produces complete evacuation usually within 2-15 minutes. Easy twist-off tip; also available with soothing Benzocaine. Enemeez® is effective for bowel care needs associated with spinal cord injury and disease, multiple sclerosis, traumatic brain injury, spina bifida, long-term care, stroke and constipation associated with oncology or opioid treatment. APDM produces a sensor-based gait and balance analysis system called Mobility Lab. In under 5 minutes you can objectively measure your patient’s gait and balance and compare them to age matched norms, as well as baseline measurements. This system is perfect for assessing the fall risk of your patient. Avanir Pharmaceuticals promotes NUEDEXTA® (dextromethorphan HBr & quinidine sulfate), the first treatment FDA-approved for pseudobulbar affect (PBA). PBA is characterized by involuntary, sudden, and frequent episodes of crying and/or laughing. PBA occurs in approximately one-third of patients with certain neurologic conditions. See www.NUEDEXTA.com for Important Safety and full Prescribing Information. The Brain Injury Association of America (BIAA) is the country’s oldest and largest nationwide brain injury advocacy organization. Our mission is to advance brain injury prevention, research, treatment and education and to improve the quality of life for all individuals impacted by brain injury. Brooks Rehabilitation has been serving the Southeast region for over 35 years. A non-profit organization based in Jacksonville, FL, Brooks operates a system of healthcare, including one of the nation’s largest rehabilitation hospital, a large home healthcare agency, 26 outpatient clinics, a research division, senior services, and multiple community programs. Visual3D is the premier 3D biomechanics research software for biomechanical modeling, analysis, and reporting functions. In addition to handling all kinematics and inverse dynamics calculations, we can now provide for custom real-time biofeedback applications. Visual3D is used in rehabilitation, gait analysis and retraining, clinics, sports injury prevention, and many other applications. Casa Colina Centers for Rehabilitation is a non-profit medical and rehabilitation provider that administers physician-directed care for people with disabling conditions resulting from accidents, disease or illness. Continuum of care includes inpatient, transitional and outpatient rehabilitation, physician clinics, children’s services, residential care, and much more. In 2013, it celebrates 75 years of service. Children’s Healthcare of Atlanta, Inpatient Rehabilitation, offers therapy designed for pediatrics, adolescents, and young adults (birth to 21 years old) to address needs after an illness or a traumatic injury. Patients receive an interdisciplinary approach to care to promote independence as well as maximize function and community integration. GAITRite is a truly portable pressure sensitive walkway with a quick 5 minute setup measuring temporal spatial parameters, providing easy identification of gait anomalies. The system comes in various lengths which record and analyze multiple gait cycles in a single walk, allowing accurate testing of patients. DVBIC is a unique collaboration between the Departments of Defense and Veterans Affairs healthcare systems. Through clinical care, research, and education, DVBIC and its healthcare partners serve active duty military and veterans, who have sustained a TBI, through the entire continuum of care and ultimate return to community or duty. Change the way UTIs are managed in your rehabilitation center with ellura, the only cranberry product supported by an issued Health Claim. Trophikos’s mission is to free people from chronic antibiotic use associated with UTIs. ellura is a non-antibiotic alternative that has been proven in published clinical trials. 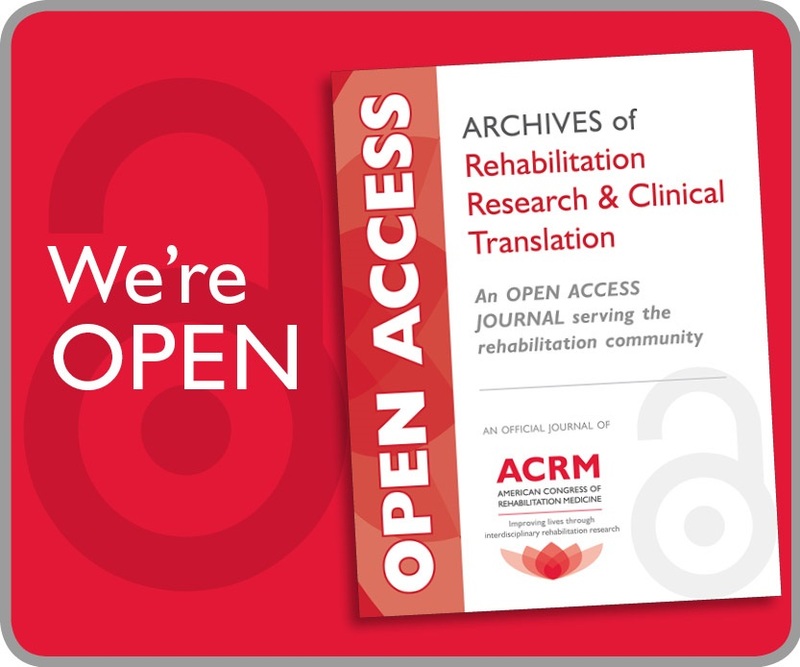 Archives of Physical Medicine & Rehabilitation is an acclaimed international journal covering the specialty of physical medicine and rehabilitation as well as interdisciplinary disciplines involved in rehabilitation. Archives boasts a 2012 Impact Factor of 2.358, according to Thomson Reuters Journal Citation Report, and is the most cited journal in rehabilitation. ForceLink develops and produces gait analysis and training systems based on instrumented treadmills and forceplates. Diagnosis of gait and training to walk safely on the street and in the home can be facilitated by the patented C-Mill system which measures the gait cycle, and projects steps and obstacles on the treadmill. InMotion ™ Robots are Redefining Recovery for a wide range of Neurologically Impaired patients. These include Stroke, Cerebral Palsy, Incomplete Spinal Cord Injury, Brain Injury, and other movement disorders. InMotion ™ Robots is the trademark of Interactive Motion Technologies which provides this technology throughout the world. The International Brain Injury Association (IBIA) is dedicated to the development and support of multidisciplinary medical and clinical professionals, advocates, policy makers, consumers and others who work to improve outcomes and opportunities for persons with brain injury. The IBIA works to develop positive relations and interactions between individuals, families, groups, organizations, institutions, diverse cultures and nations. Pleased to offer two online graduate certificates; Chronic Pain Management and Driving Rehabilitation. Instructed by leading experts in their respective fields and provides in depth knowledge in given areas. Health care professionals obtain a higher education graduate certificate from an internationally recognized university with benefits of online learning. The Model Systems Knowledge Translation Center (MSKTC) is a national center that helps Model Systems grantees facilitate the knowledge translation process to make research meaningful to those with spinal cord injury, traumatic brain injury, and burn injury. Access MSKTC resources at www.MSKTC.org. Moody Manor is a Long Term Care Facility dedicated to providing the highest quality of care and rehabilitation to Survivors of Traumatic Brain Injury in a caring, supportive and stimulating environment. An alternative to “institutional” setting or the solitary life of “home health”, we provide the best of both worlds. MyndTec is a Canadian medical device company developing innovative therapies to improve independence for people living with neurological impairment. MyndMove is a premarket neuromodulation therapy based on advanced FES principles designed to restore voluntary reaching and grasping movements to individuals paralyzed by stroke or spinal cord injury. NeuroRestorative is a leading provider of post-acute rehabilitation services for people of all ages with brain injuries and other neurological challenges. In a variety of locations and settings, we offer a continuum of care and rehabilitation options, including specialized services for children, adolescents, and Military Service Veterans. The Parker Indego™ is a lower limb powered orthosis that allows people with paralysis the opportunity to stand up and walk. Prospira PainCare is quickly growing to become the nation’s premier provider of comprehensive, multidisciplinary pain management services. Through the assemblage of many of the nation’s leading pain centers and practices, Prospira PainCare delivers world-class treatment to restore the health and quality of life for those suffering from acute, chronic or intractable pain. ProtoKinetics LLC offers movement analysis systems for dynamic and standing studies. The Zeno Walkway and PKMAS software program quickly and easily produce pressure, temporal and spatial parameters over a variety of testing protocols. The equipment is ideal for clinical/research evaluations of individuals with central nervous system disorders, peripheral neuropathy, stroke, etc. Rehab Without Walls provides complex neurorehab in the home and community where people live. We maintain the largest post-acute neuro outcomes database with over 5,000 patients. We focus on integrity and transparency in worker’s compensation and private health insurance. Feel free to ask us how and let us show you. Restorative Therapies is the leader in FES powered systems providing stimulation of upper and lower extremities and trunk muscles. Cycling, stepping, elliptical and now supine cycling FES systems are available. Our unique database system, RTI Link, also makes Restorative Therapies an attractive clinical and research partner. Stratus Pharmaceuticals manufactures a quality product line of Rx and OTC including wound care products such as Venelex-Sonafine-Vasolex, dermatology specialties (Hydroquinone, Urea, Lactic Acid…) and products (Vacuant Mini Enema and Vacuant Plus Mini Enema) to improve patients quality of life by managing their bowel care programs. The Joint Commission’s Disease-Specific Care Certification program is designed to evaluate clinical programs across the continuum of care. Joint Commission accredited organizations may seek certification for virtually any chronic disease or condition. Achieve the Gold Seal of Approval and be proud to provide the highest level of patient care. The University of Alabama at Birmingham (UAB)is a world-renowned research university and medical center. At UAB, the Spain Rehabilitation Center and the Department of Physical Medicine and Rehabilitation are the core of a multi-faceted program designed to be a first choice in patient care, education, and research. Thieme is an award-winning international medical and science publisher that promotes the latest advancements in clinical practice and rehabilitation research with titles that include Essentials of Spinal Cord Injury, Decision Making in Neurocritical Care, Traumatology for the Physical Therapist, Physical Therapy for the Stroke Patient, and the comprehensive platform eNeurosurgery. Tobii ATI is the leading provider of eye-tracking enabled communication and accessibility devices that allow the disabled to communicate, control their environment and live more independently. The company delivers the most advanced communication tools available through award-winning eye-tracking hardware and software solutions. For more information, please visit www.tobiiati.com. tyromotion GmbH is one of the worldwide leading providers of robotics and computer-aided therapeutic devices in the area of neuro-rehabilitation. Our portfolio includes tailor-made solutions for the upper extermity, especially for hand and arm rehabilitation. Our specialties also include therapy robotics, computer aided therapy, and finger rehabilitation. Zynex Medical develops and markets pain control and neurological devices to hospitals and clinics worldwide. Many of the clinics and hospitals use our world-renown NeuroMoveTM /EMG/NES system for stroke rehabilitation and SCI treatment. Zynex Medical is a wholly-owned subsidiary of Zynex, Inc. a publicly traded medical device company (OTCBB: ZYXI).